View basket “AC POWER ADPTR MINIMC PRODUCTS (10W -10 TO 50” has been added to your basket. The AccessEtherLinX/4 enables service providers to offer differentiated, Transparent LAN services to multi-tenant building and business customers. Residing at the customer premises, the AccessEtherLinX/4 provides a VLAN-based, Layer 2 entry point to the last mile fiber network, trunking, differentiating and separating customer traffic. 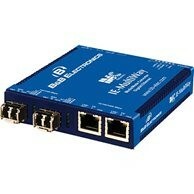 Featuring SNMP management, 802.1Q VLAN, 802.1p QoS, traffic prioritization, bandwidth control and multicast pruning/snooping (using IGMP v1, v2), the AccessEtherLinX/4 is perfect for a wide range of Fiber to-the-Home, Fiber-to-the-Curb and Fiber-to-the-Business (collectively FTTx) services, and is an ideal solution for delivering those Ethernet based services to customers quickly and cost-effectively. Designed with a small footprint, the AccessEtherLinX/4 facilitates easy installation inside the premises. Bandwidth control and 802.1Q VLAN compatibility built-in: The AccessEtherLinX/4 accepts traffic containing VLAN tags on the Uplink port and directs traffic to the twisted pair downlink ports or to management based on VLAN ID. In addition to assigning 802.1Q VLAN-tags on a per-port basis, priority can be defined for each port and SNMP tag; traffic is divided into a hi/low level for packet prioritization in the queue. 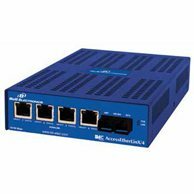 The AccessEtherLinX/4 also includes bi-directional bandwidth control, and supports IGMP multicast pruning to ensure the necessary amount of IP multicast packets are bridged.